Dual CS 505-4 review | What Hi-Fi? Back in 1983, the first generation of Dual’s evergreen CS 505 cost just over £90. At that time it was the go-to budget turntable and was ideal for those who wanted a good sounding, fuss free record player. Back then you’d have to spend a lot more to buy Rega’s even more talented first generation Planar 2. While the Dual has been developed over the intervening years, anyone comparing that original with the current Mk4 version would be hard pressed to tell the difference. Look closely and you’ll find a slightly different plinth and revised arm bearings, but the basic building blocks of the CS 505 look to have barely changed. And that’s no bad thing, as the aspects that appealed to us so much back then still continue to do so now. 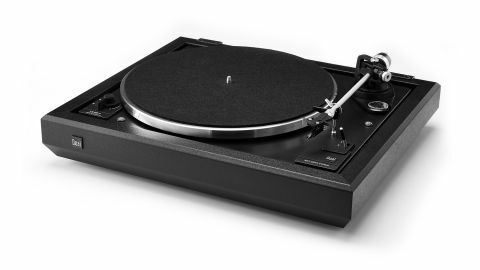 The CS 505 is rare in the world of affordable turntables by having a suspended sub-chassis. The whole top plate, which supports the main bearing that the platter spins on and the arm assembly, is isolated from external vibrations by springs. This makes the Dual less fussy about where it sits than most rivals, even if a good, low resonance support still makes for a better performance. It’s also a semi-automatic design. This is where the arm lifts the cartridge – an Ortofon OM10 moving magnet in this case – off the record at the end of a side. It also switches off the motor. This is handy if you have a habit of putting on a record and leaving before it ends or just don’t necessarily want to have to get up and do it all manually. Speed options are the usual 33.3 and 45rpm and can be changed at the flick of a switch rather than having to physically move the rubber belt, as with most rivals. There’s even the option of a subtler speed adjustment to get things just right. Overall build is pretty good, though what impressed at budget price levels in the past is now only just on the right side of acceptable at the CS 505-4’s much higher price. The plinth feels a little basic and the thin metal platter hardly suggests high quality. Still, the suspended top plate moves smoothly and the arm bearings are smooth and well adjusted. The semi-automatic operation may sound a little clunky in operation, but it works efficiently enough. While there are obvious reasons for the price increase over the decades, it’s worth noting that the current generation of Rega Planar 2 (with cartridge included) costs just £399. That’s a sizeable price premium that the Dual can only fully justify if its semi-automatic operation is a must. That’s not to say it doesn’t sound good, as this is still a tidy performer. It doesn’t necessarily have the sonic authority or dynamic punch of the very best – yes, that Rega again – but still manages to deliver a musically convincing performance. We start with Nick Cave’s The Boatman’s Call and the CS 505-4 digs up a fair bit of detail and arranges it into a cohesive whole. Low-level dynamics are rendered with care, so the texture and nuance in Cave’s distinctive voice come through with clarity. The presentation is agile and has a decent amount of precision partnered with a nice sense of flow. Things are pretty good rhythmically, the Dual communicating the changing momentum of the album well. Low frequencies aren’t the weightiest around and are a little soft around the edges, but there is enough in the way of definition and grip to avoid this becoming an issue. Moving to Beethoven’s Sixth Symphony shows that the CS 505-4 has little trouble coping with complex works. For its price, the Dual sounds composed and controlled. The sound staging isn’t the most expansive, but the deck delivers enough in the way of space and lack of clutter to give us a nicely laid-out stereo image. Tonally, the Ortofon cartridge is on the leaner side of neutral, but for the most part has enough in the way of balance and refinement to avoid intruding on the listening experience too much. It’s surprising just how capable this Dual design has remained considering how little it has changed over the years. While no longer a class leader, or as competitive on price as it once was, the CS 505 remains a viable choice for those who want a good sound mated to a high degree of convenience. In a market packed full of purist, manual offerings, for some people it’ll make a lot of sense.